On crazy busy weeknights, I need a quick & easy, but hearty dinner to satisfy my active family. My new go to meal is Homemade Burrito Bowls. I use rotisserie chicken, Minute® Rice, and all the fixin’s. Everyone creates their own bowl to their liking and no one leaves the table hungry. Instead we’re all ready to tackle our schedule. This is a sponsored post from Minute® Rice. All opinions, pictures, and recipes are my 100% my own. your favorite add-ins: avocado, shredded lettuce, salsa, shredded cheese, sour cream, chopped tomatoes, chopped red onion, tortilla chips, chipotle dressing. In serving bowls, layer the above ingredients to your liking. As our girls get older, our schedule gets more and more crazy. Top that with the holiday activities, and this mama is going nuts. Our schedule is packed with Girl Scouts, swim team, holiday and school activities. When everyone gets home from school, work and our activities, we are ALL famished. 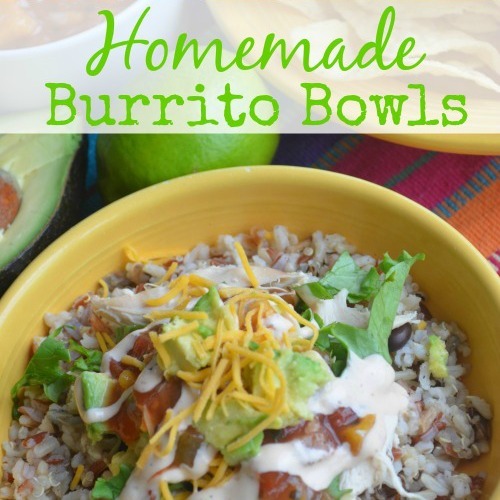 Stopping for take out would be easy (and expensive) since I drive by multiple fast food restaurants on my way home from work and swim team, but we have come to love our own version of Burrito Bowls much better than the chains. We enjoy them so much that they are on our menu at least once a week. In this version, I used rotisserie chicken from the store, but I’ve also used leftover turkey from Thanksgiving and leftover roasted chicken from Sunday dinner. And Minute® Rice has become my go-to ingredient. If you prefer white rice, you can have great-tasting, fluffy white rice in just 5 minutes with Minute® White Rice. Or if you like the nutty, rich flavor of brown rice, Minute 100% Whole Grain Brown Rice is a delicious, nutritious option, as it has the same nutritional values as regular long cooking brown rice, but is ready in just 10 minutes, – just ¼ the time of regular brown rice. Both Minute® Brown and White Rice are gluten free, too. Minute® Multi-Grain Medley is the newest product from Minute® Rice. It’s a blend of four gluten-free foods and made with 100% whole grains, including long grain brown rice, Thai red rice, wild rice and quinoa and it conveniently cooks in 10 minutes. On nights when I serve Burrito Bowls, I set all of the ingredients out on the counter, kind of like a salad bar, and everyone prepares their bowl with their favorites. Recently we tried Minute® Multi-Grain Medley in place of our typical white or brown rice for a new variation and we all really liked the flavor. For more information about the products, stop by Minute® Rice, where you’ll also find over 400 recipe ideas, great for any day of the week and any time of the day. These look quick, easy, inexpensive, and healthy. Thanks so much for sharing this! I can’t wait to make them soon. Pinning! I have used Minute Brown Rice, but I didn’t know they had a multi-grain medley. I’ll have to keep my eye out for that. Thanks, again, Kristia! We really enjoyed the multi-grain medley. It was a nice change from traditional rice.